Living about two and a half hours away from Chicago, it’s sad how rarely I go to the city! A couple weeks ago, though, I had the opportunity to go to Chicago with some of the lovely ladies of the Oak Street Conservation Facility. We were on the road bright and early with only one thing on our mind: conservation! I was so excited to spend the whole day touring one conservation lab after another. Our day started at Northwestern Library’s Conservation Department. I had never been to Northwestern before and the campus was truly idyllic; it felt like a magical forest, a bit foggy with lots of trees and little paths. We made our way to the basement (of course!) to the lab. Tonia Grafakos, the head of the lab, gave us a tour. It was surprising to learn about the differences between Oak St. and Northwestern — for one, their collection of backlogged books that need repair is much smaller than Oak St.’s! We had the opportunity to see their neat collection of international Obama memorabilia, which ranged from paintings in barber shops to lollipop sticks to gum wrappers. The conservation department always gets to work with the most interesting and strange things! Given our long drive up to Chicago, it was already time for lunch! We stopped at a cute place called Tapas Barcelona, right down the street from Northwestern. They really had great tapas, especially if you love goat cheese like me! The next stop was the Art Institute of Chicago. We had the opportunity of touring the prints and drawings and book labs. As expected, the labs were beautiful. I couldn’t get over how much counter space there was. We looked at all sorts of projects, one which included piecing together a five foot print that had been cut into 56 individual pieces. It was incredible to see how the conservator, Kim Nichols, put it all together, carefully studying the pieces and how the artist worked. It has taken her four years and she’s almost done! 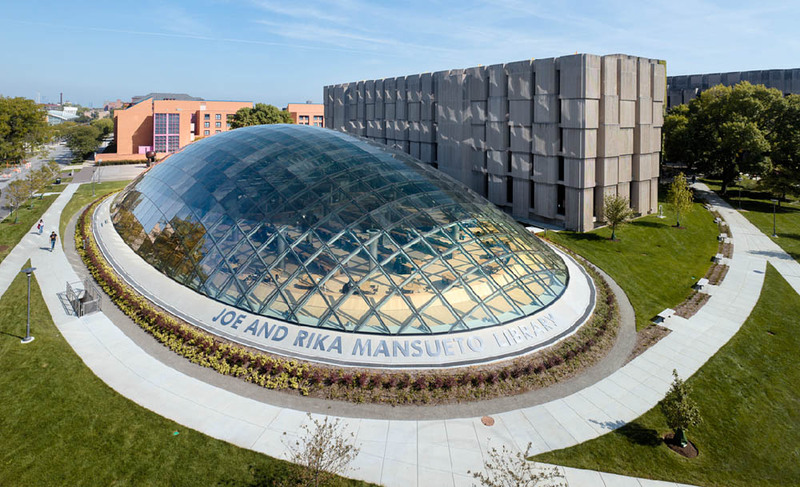 Our third lab was the University of Chicago’s Mansueto Library. If you haven’t already, check out some pictures of this gorgeous library! Airy and spacious is an understatement. This lab was pretty different from the ones we had toured earlier, especially given its environment. Ann Lindsey, the head of the lab, gave us a tour of the space and details about the decisions she made in designing the lab. This was really useful in learning more about the equipment and which aspects of the lab are used for different types of projects. We also had the opportunity to see the automated storage and retrieval system, which is located underground. 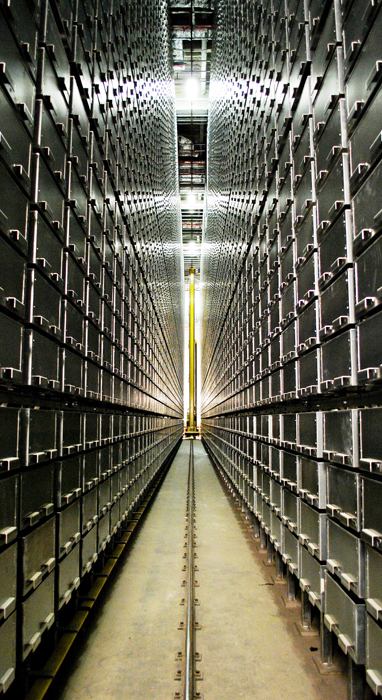 The materials stored in this area are actually controlled by robots — the materials are placed in metal trays; when a patron requests an item, the robot brings the whole tray up to the library desk, at this point a library employee finds the item from the tray. It was really neat to see this huge space totally run by robots — crazy! It also made me thankful to think that a robot could (most likely) never take over my job as a conservator — hopefully the work is too detailed and involved for any robot. Our last stop of the day was at an open house for the Graphic Conservation Company. This was a great opportunity to see how a private conservation firm works. I was surprised at how big it was — a big open room with plenty of long tables. Against the wall there were board shears, presses, and other equipment. One of the big projects at Graphic was the 13th Amendment, which took six months to conserve. You can read more about the project in this Chicago Tribune article. After a very long day, we headed down to the U of I. After seeing so many different types of labs, I felt even more confident that I wanted to go into conservation. Having spent many months looking for a job/internship, I was starting to get discouraged that it would be too hard to break into the field. Meeting so many great conservators across the field and learning about their work was refreshing. It gave me more perspective — there are plenty of labs out there with lots of work, I just need to be patient!